Choosing a lighting kit for conducting documentary interviews is an important task, and if you’re going to be shooting sit down interviews, your production values depend on it. 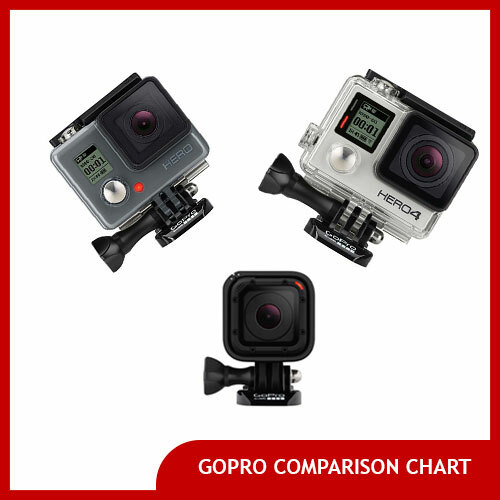 Size, weight and wattage are both factors for many filmmakers to consider when picking out lighting gear, because unless you’ve got a dedicated grip truck or a permanent studio, you’ll want to be able to pack away your equipment in a case or two so it can be easily transported to and from locations. The good news is, with the proliferation of LED and CFL-based lighting systems, interview lighting setups are now lighter and more easily-transportable than ever before. Not to mention more affordable! 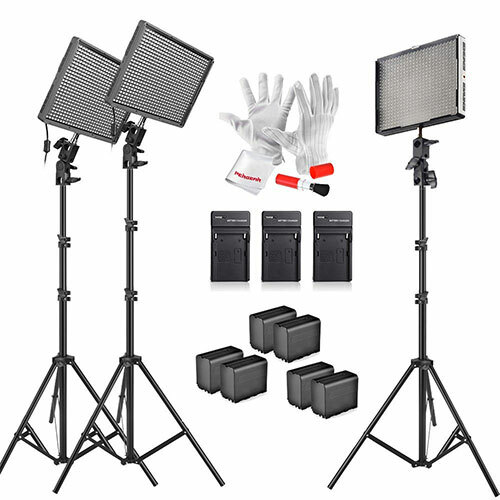 This Lowel kit is great for documentary filmmakers looking to stock up on what they need all in one go (though you’ll still probably want to pick up a pair of heat resistant gloves since these lights can get hot). 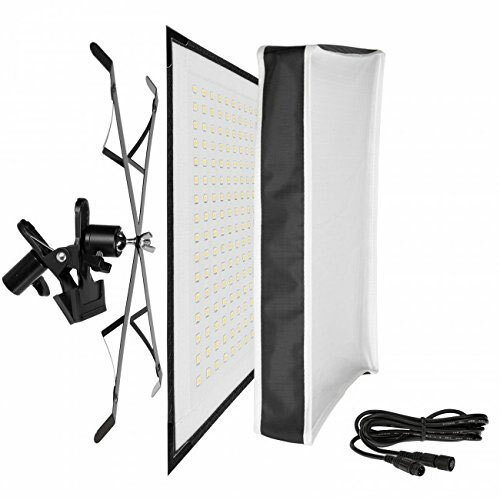 This kit includes four tungsten (“indoor”) balanced lights as well as the gels to convert them to daylight, plus a softbox, three sets of barndoors, an umbrella for light diffusion and a hard carrying case. 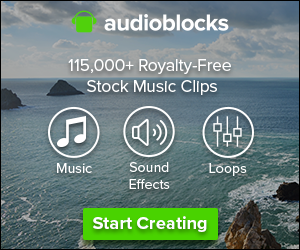 The full kit puts out 1650 watts– nothing to sneeze at. The lights included are: a 300w max. Rifa-44 collapsible softlight, 500w max. focusable Omni-light, and a 250w focusable Pro-light & a 750w max. broad throw Tota-light. 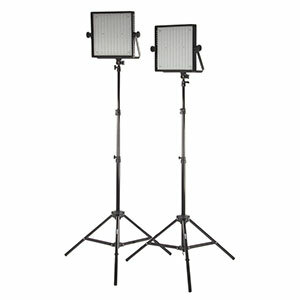 This kit with two flat LED lights and two stands is a great affordable option for documentary film interview lighting kits. Because they’re LED-based, you can dim the lights with a convenient dial on the back of the light, so you can get just the right amount of light without having to mess with diffusion, ND filters, or having to move the light stand further away from your interview subject. Although the stands are set at full-height in the picture to the left, they are adjustable to the height of a seated interviewee. You can also purchase padded carrying case to go with the lights to protect them. The Wescott Flex lighting system is a new take on interview lighting: a 1 foot by 1 foot light that is flexible enough to fold up into a small lighting case. 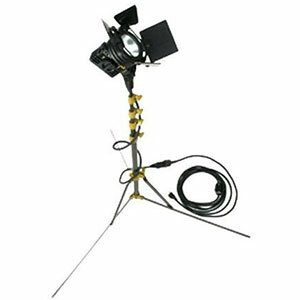 This particular Wescott Flex kit comes with a mounting bracket and a softbox light difusser to attach this light to a lighting stand (not included but available separately) and a dimmer which can be used in conjunction with a portable battery pack. The Flex light provides a surprising amount of light for such a small and light and flexible system that you can take with you anywhere. 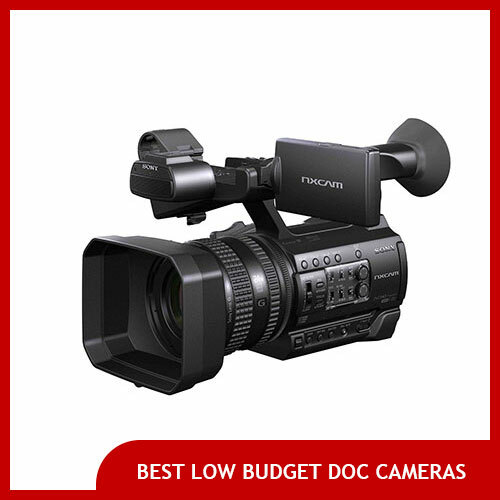 Perfect for filmmakers who need to travel with their lights and set up in cramped spaces. Browse other Flex light products here. 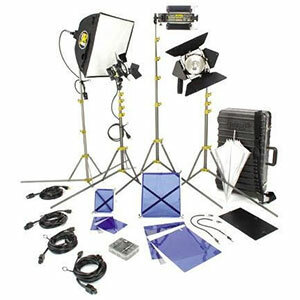 This kit includes three CFL lights (each with sockets for 5 bulbs), as well as the light stands to go with them, a carrying case and softboxes that fit over the lights to diffuse them and cast an even, flattering glow on your interview subject. Because CFLs are not dimmable as LEDs are, you can adjust how much light each lamp emits by individually switching on and off each bulb (each light has five lights witches on the back of it). 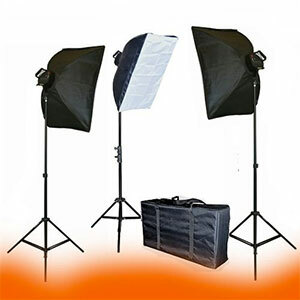 Softboxes like these are used for documentary interview lighting setups because they help cast soft light on your subject in an even pattern. This full kit weighs a little over 30 pounds, making it surprisingly portable. The Lowel Pro light is a small light that documentary filmmakers often use as a hair light. It is placed behind the seated interview subject (sometimes on a boom arm so it’s directly across from the camera) to create some “background separation” between the subject and the environment they’re in, like an outline. It also creates a nice, soft glow around the subject. The Lowel Pro is great because it’s small, lightweight enough to be hung on a boom arm, and uses relatively little wattage, plus the lamp itself is so small that you can attach reasonably sized lighting gels to change the color of the light. If you want to dim the Lowel Pro, you’ll need to pick up an external power dimmer, such as a router speed control (we’ve tested these and they work great with the Lowel Pro). This interview lighting kit includes three lights: one for a key light on your subject, one for a fill light to illuminate the entire area, and a hair light on a boom arm which you can suspend behind your subject to give them some edge separation from the background. 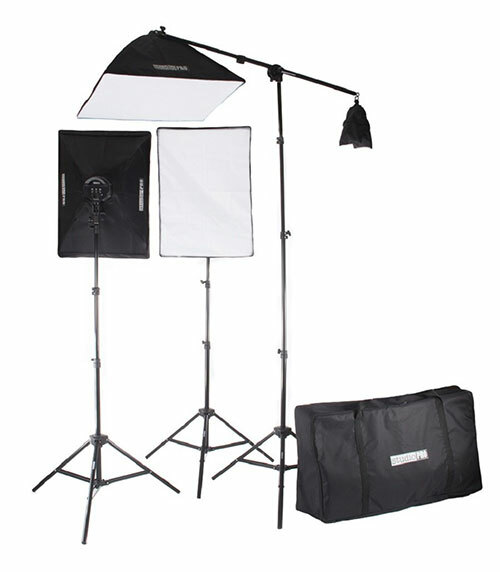 This is a self contained kit: it comes with a carrying case and counterweight for the boom arm. Each lighting head uses 5500K Daylight balanced flourescent bulbs and comes with a softbox to ensure your subject is illuminated evenly and in a flattering way. Since this unit uses CFL lightbulbs it isn’t dimmable but each lighting head has variable switches on the back to control how many bulbs are illuminated, thus changing the brightness of the light on your subject. Comes with three lighting stands and a boom arm, as well as bulbs for each socket. Weight: Approximately 36 pounds. Note: If you’re interested in this type of lighting kit (2 lights and a light on a boom arm) but you’re not sure about using CFL lights that need to be replaced, consider this version with LED lights. If you’re interested in an interview lighting kit that’s battery powered, so you can set up interviews outdoors, consider this LED lighting kit. It comes with three LED lights slightly larger than iPads, power adapters that plug into the wall, and batteries and chargers for use when a wall socket isn’t available or convenient. These lights are daylight balanced but they also have built in filter holders and come with orange filters to be match indoor (tungsten) lights. Comes with convenient compact carrying cases with shoulder straps, three lighting stands and a cleaning kit. We pretty much swear by this instructional tutorial DVD. 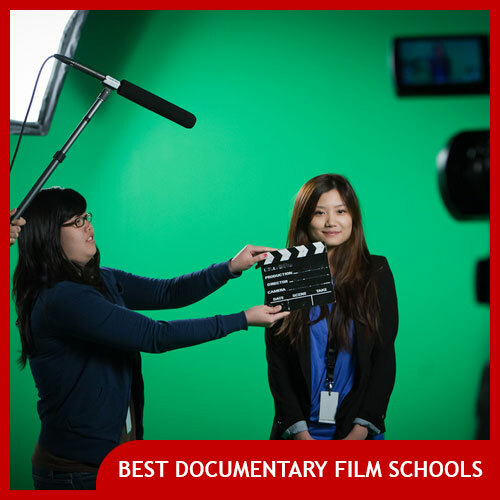 It’s a 60 minute, no-frills crash course in how to set up, light and shoot documentary film interviews. 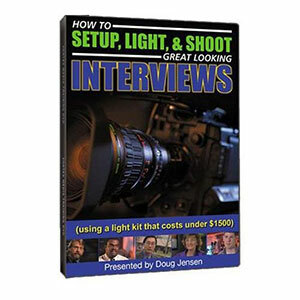 The instructor (an experienced camera guy who’s shot for television news programs like 60 Minutes) shows you in detail how to set up lights in a variety of location situations to achieve a high production value lighting effect, whether you’re going for a modern look, a dramatic look or a classic look for your interviews. The instructor also shows you the best settings to use on your camera when you shoot your sit-down interviews, and teaches you how to deal with common situations like how to make a conference room that you’re stuck film in look look less, well, conference-room-y with your lighting kit. Note: the same DVD is also available in a specialized version for those with LED lighting kits .